It was a night of re-matches as Tommy Dreamer faced A.J. Styles and Rob Van Dam challenged Sting for the World title as TNA presented their latest pay-per-view offering, Sacrifice, shown on a three day delay on Challenge here in Britain. No pre-show for us Brits this month, so the broadcast began with tag team action as Mexican America, Hernandez and Anarquia, accompanied by Sarita and Rosita, faced Ink Inc, Jesse Neal and Shannon Moore. The proved to be a very enjoyable opener. It started off slowly but soon developed into a quality encounter. Moore and Neal are really starting to look great as a unit, while the Mexicans played their part well, with the girls coming in to run interference every so often. The end came when Hernandez hoisted Neal onto his shoulder and slammed him down to the mat to get the pin. I guess Russo hasn’t come up with a name for that one yet. After the Jarretts tried to weasel their way out of the mixed tag match it was on to singles action as Robbie E, accompanied by Cookie, took on Brian Kendrick. It was nice to see a non-title X division singles match on the show. Robbie attacked Kendrick while he was doing his meditation thing, only for Kendrick to beat him to the punch a number of times. Robbie, although his gimmick still annoys the hell out of me, put in a great effort, the perfect opponent for a guy like Kendrick. Despite E’s offence it was Kendrick who took the win after taking Robbie down with a leg lariat. Afterwards Kendrick tried to recruit Robbie and Cookie to his cause. The first title match saw Madison Rayne facing Mickie James for the Knockouts title. Tara’s contract was also on the line in this one. Well, at least this was longer than last month’s encounter, and a whole lot better as well. Before the match began Tara came down to the ring, despite being told to stay backstage by Madison. The match itself was pretty good, with Madison and Mickie putting together some good sequences. Throughout the match Tara threatened to interfere, but when Madison grabbed her loaded glove from under the ring Tara stopped her from using it. However, while the referee was taking a snooze Tara came into the ring wearing the glove. Madison screamed at her to use it on Mickie, but after some thought she used it on Madison instead. Seconds later it was all over. The referee woke up from his slumber and counted Mickie’s title retaining pin. The title action continued as Max Buck challenged Frankie Kazarian for the X Division title. Now this was a great match, a fine example of the current X Division product. As always Kazarian put in a very good performance, while Buck, away from a tag team environment, showed that if handled correctly he could have a flourishing singles career in the future. It was an exciting back and forth encounter with plenty of fast paced action and great moves before Kazarian took the pin after a shining wizard. Nice stuff all round. Then it was time for the monthly Abyss brawl as the monster went up against the undefeated Crimson. Crimson did his best Bill Goldberg mannerisms before taking it to the monster early on. Inevitably Abyss came back into the match with his usual brawling style, even trying to introduce Janice into the equation at one point. But in the end the undefeated streak continued as Crimson took the big guy with a sky high power bomb. It was okay, but it did seem to drag after a while. The third title match of the evening saw Matt Hardy and the returning Chris Harris challenging Beer Money, Robert Roode and James Storm, for the Tag Team titles. This was okay. Roode and Storm put in their usual good performances, and Hardy looked okay, but Chris Harris, the man who lighted up many a show during TNA’s early years and was touted as a future champion looked a shadow of his former self. He looked like he’d slowed down/ a hell of a lot in recent years. His performance was competent, but certainly not on a part with those of the past. In the end the champs retained the titles after taking Harris down with the old America’s Most Wanted finisher, the death sentence. Not bad, but if Chris Harris wants to re-establish himself in TNA then he’s got to make a few changes. The first of the aforementioned re-matches saw Tommy Dreamer taking on A.J. Styles in a no disqualification match. For the most part this was okay. It started off as a good old fashioned wrestling match before turning into a brawl with a few weapons shots. However, the end seemed a bit anti-climatic. The crowd were a bit dead as Bully Ray and Christopher Daniels made cameo appearances before Dreamer took Styles out with a slightly messy looking pile driver through a table. The penultimate match saw Jeff and Karen Jarrett taking on Kurt Angle and Chyna. Chyna looked…well…how can I put this? She looked better than she did in the 101 Reasons… documentary from a few years back. The action between Angle and Double J was, as always, extremely well executed. But sadly the women had to get involved. Chyna looked like someone who hadn’t been anywhere near a ring in years. She didn’t do much but what she did do wasn’t pretty. We had stereo ankle locks at the end as the Jarretts tapped out to give Angle and Chyna the win. The main event saw Rob Van Dam challenging Sting for the World title. I wasn’t exactly impressed with their efforts last year, and when I watched this one I had exactly the same feeling. It was okay, but it wasn’t exactly enthralling. It didn’t help that we had an overlong brawl through the crowd, something that would have been better than the brief incursion into the fans that Styles and Dreamer had. Then we had the slightly dodgy ending, with Sting going for a scorpion death drop and RVD falling too soon. When they went for the same move again it made the mistake more blatant. Sting really should have taken the winning pin first time round. Sting was then confronted by his next challenger as Mr. Anderson left his commentary position (and boy did he do a good job there) for a stare down. 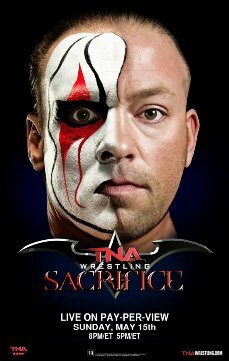 In conclusion - if this year’s Sacrifice is proved anything it’s that TNA still has the same old problem. The show got off to a good start, but as time went on the match quality got worse, with things taking a definite slide three matches from the end. Styles and Dreamer looked a good match on paper, but they really could have done with a longer and more intense brawl through the crowd. The Angle/Jarretts situation is getting kind of boring bow, and Chyna, looking puffy and devoid of the muscle that made her a star over a decade ago brought nothing new to the table. As for the main event it suffered from that age old ailment of not really meaning that much. Why would two guys who supposedly respect the hell out of each other engage in a heated brawl through the fans? So in all TNA Sacrifice doesn’t get the thumbs up or thumbs down this. One final thing. Do TNA have to talk about how they’re a wrestling company so much? We know what you do, and how you’re not ashamed of it, unlike “the other promotion”. Just don’t keep ramming it down our throats!